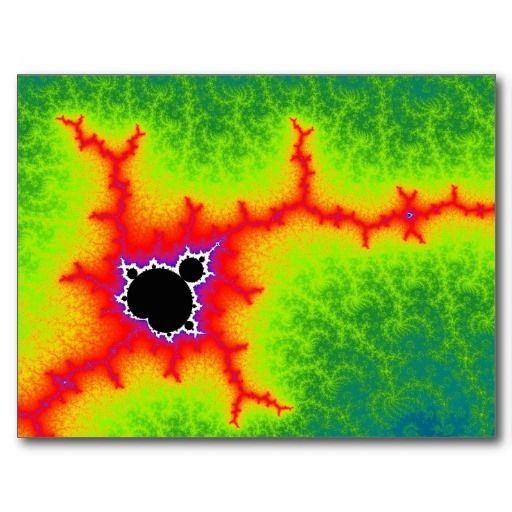 Part of the fun of drawing fractals with Mandelbrot Explorer is discovering the limitless colour schemes that can be used to colour the images. Of course, when you're getting started, you'll want to use the Built-in Colour Schemes, accessed from the colour-scheme toolbar or from the Colours menu. These cycle through a range of colours, or through a range of shades of grey, and do so no matter how far you zoom in. Setting one of these colour schemes allows you to start exploring interesting regions immediately. The final built-in colour scheme is a little different from the others. This will apply a randomly chosen colour scheme, so will have a different effect every time you click that button. This random scheme aims to produce a scheme that is aesthetically harmonious as well as bright and vibrant enough to see clearly. Using the random colour scheme allows you to explore easily using different colours, and doing this shows up all kinds of detail. If you want to explore more advanced colouring options, the first thing to do is to learn about how Colour Schemes work in Mandelbrot Explorer. New to version 3.0 of Mandelbrot Explorer is the use of Layers to define Colour Schemes, which make it easier to see where the colours come from and to edit your colour scheme. Once you've understood the concept of Layers, there are two plugins. One allows you to add layers of colour, whilst the other allows you to view your colour scheme, together with its individual layers, and to edit that scheme. There are Undo and Redo buttons on the toolbar to allow you to go back to a previously used colour scheme.